It’s been eleven months since I realised that I could melt metal. Since then, I’ve built a furnace, a shed to keep it in, a nice solid workbench, and cast a few ingots. Now I’m going to attempt my first ever sand-casting. I’ve recently built a simple wood lathe. So I’m able to make a round wooden pulley pattern. This pulley will eventually be used to power said wood-lathe from a proper motor, rather than the electric drill which I’m currently torturing. 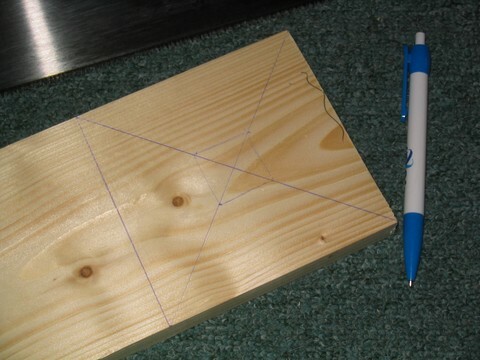 I started off with an offcut of wood, marking diagonals to find the center. This will let me position it accurately on my wood lathe.